The properties defined in the following sections affect the visual presentation of characters, spaces, words, and paragraphs. This property specifies the indentation of the first line of text in a block. More precisely, it specifies the indentation of the first box that flows into the block's first line box. The box is indented with respect to the left (or right, for right-to-left layout) edge of the line box. User agents should render this indentation as blank space. The indentation is a fixed length. The indentation is a percentage of the containing block width. The value of 'text-indent' may be negative, but there may be implementation-specific limits. If the value of 'text-indent' is either negative or exceeds the width of the block, that first box, described above, can overflow the block. The value of 'overflow' will affect whether such text that overflows the block is visible. The following example causes a '3em' text indent. Note: Since the 'text-indent' property inherits, when specified on a block element, it will affect descendent inline-block elements. For this reason, it is often wise to specify 'text-indent: 0' on elements that are specified 'display:inline-block'. Left, right, center, and justify text, respectively, as described in the section on inline formatting. If the computed value of text-align is 'justify' while the computed value of white-space is 'pre' or 'pre-line', the actual value of text-align is set to the initial value. In this example, note that since 'text-align' is inherited, all block-level elements inside DIV elements with a class name of 'important' will have their inline content centered. Note. The actual justification algorithm used depends on the user-agent and the language/script of the text. Conforming user agents may interpret the value 'justify' as 'left' or 'right', depending on whether the element's default writing direction is left-to-right or right-to-left, respectively. This property describes decorations that are added to the text of an element using the element's color. When specified on an inline element, it affects all the boxes generated by that element; for all other elements, the decorations are propagated to an anonymous inline box that wraps all the in-flow inline children of the element, and to any block-level in-flow descendants. It is not, however, further propagated to floating and absolutely positioned descendants, nor to the contents of 'inline-table' and 'inline-block' descendants. Underlines, overlines, and line-throughs are applied only to text (including white space, letter spacing, and word spacing): margins, borders, and padding are skipped. If an element contains no text, user agents must refrain from rendering these text decorations on the element. For example, images will not be underlined. The 'text-decoration' property on descendant elements cannot have any effect on the decoration of the ancestor. In determining the position of and thickness of text decoration lines, user agents may consider the font sizes of and dominant baselines of descendants, but must use the same baseline and thickness on each line. Relatively positioning a descendant moves all text decorations affecting it along with the descendant's text; it does not affect calculation of the decoration's initial position on that line. Each line of text is underlined. Each line of text has a line above it. Each line of text has a line through the middle. Text blinks (alternates between visible and invisible). Conforming user agents may simply not blink the text. Note that not blinking the text is one technique to satisfy checkpoint 3.3 of WAI-UAAG. The color(s) required for the text decoration must be derived from the 'color' property value of the element on which 'text-decoration' is set. The color of decorations must remain the same even if descendant elements have different 'color' values. 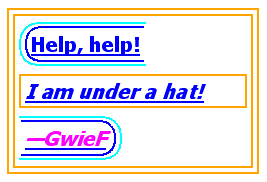 ...the underlining for the blockquote element is propagated to an anonymous inline element that surrounds the span element, causing the text "Help, help!" to be blue, with the blue underlining from the anonymous inline underneath it, the color being taken from the blockquote element. The <em>text</em> in the em block is also underlined, as it is in an in-flow block to which the underline is propagated. The final line of text is fuchsia, but the underline underneath it is still the blue underline from the anonymous inline element. This diagram shows the boxes involved in the example above. The rounded aqua line represents the anonymous inline element wrapping the inline contents of the paragraph element, the rounded blue line represents the span element, and the orange lines represent the blocks. The spacing is the normal spacing for the current font. This value allows the user agent to alter the space between characters in order to justify text. This value indicates inter-character space in addition to the default space between characters. Values may be negative, but there may be implementation-specific limits. User agents may not further increase or decrease the inter-character space in order to justify text. Character spacing algorithms are user agent-dependent. In this example, the space between characters in BLOCKQUOTE elements is increased by '0.1em'. When the resultant space between two characters is not the same as the default space, user agents should not use ligatures. The normal inter-word space, as defined by the current font and/or the UA. This value indicates inter-word space in addition to the default space between words. Values may be negative, but there may be implementation-specific limits. Word spacing algorithms are user agent-dependent. Word spacing is also influenced by justification (see the 'text-align' property). Word spacing affects each space (U+0020), non-breaking space (U+00A0), and ideographic space (U+3000) left in the text after the white space processing rules have been applied. In this example, the word-spacing between each word in H1 elements is increased by '1em'. Puts the first character of each word in uppercase; other characters are unaffected. Puts all characters of each word in uppercase. Puts all characters of each word in lowercase. The actual transformation in each case is written language dependent. See RFC 3066 ([RFC3066]) for ways to find the language of an element. Only characters belonging to "bicameral scripts" [UNICODE] are affected. In this example, all text in an H1 element is transformed to uppercase text. This value directs user agents to collapse sequences of whitespace, and break lines as necessary to fill line boxes. This value prevents user agents from collapsing sequences of whitespace. Lines are only broken at newlines in the source, or at occurrences of "\A" in generated content. This value collapses whitespace as for 'normal', but suppresses line breaks within text. This value prevents user agents from collapsing sequences of whitespace. Lines are broken at newlines in the source, at occurrences of "\A" in generated content, and as necessary to fill line boxes. This value directs user agents to collapse sequences of whitespace. Lines are broken at newlines in the source, at occurrences of "\A" in generated content, and as necessary to fill line boxes. Newlines in the source can be represented by a carriage return (U+000D), a linefeed (U+000A) or both (U+000D U+000A) or by some other mechanism that identifies the beginning and end of document segments, such as the SGML RECORD-START and RECORD-END tokens. The CSS 'white-space' processing model assumes all newlines have been normalized to line feeds. The following examples show what whitespace behavior is expected from the PRE and P elements, the "nowrap" attribute in HTML, and in generated content. Any text that is directly contained inside a block element (not inside an inline element) should be treated as an anonymous inline element. Each tab (U+0009), carriage return (U+000D), or space (U+0020) character surrounding a linefeed (U+000A) character is removed if 'white-space' is set to 'normal', 'nowrap', or 'pre-line'. If 'white-space' is set to 'pre' or 'pre-wrap', any sequence of spaces (U+0020) unbroken by an element boundary is treated as a sequence of non-breaking spaces. However, for 'pre-wrap', a line breaking opportunity exists at the end of the sequence. If 'white-space' is set to 'normal' or 'nowrap', linefeed characters are transformed for rendering purpose into one of the following characters: a space character, a zero width space character (U+200B), or no character (i.e. not rendered), according to UA-specific algorithms based on the content script. any space (U+0020) following another space (U+0020) — even a space before the inline, if that space also has 'white-space' set to 'normal', 'nowrap' or 'pre-line' — is removed. Then, the entire block is rendered. Inlines are laid out, taking bidi reordering into account, and wrapping as specified by the 'white-space' property. If a space (U+0020) at the beginning of a line has 'white-space' set to 'normal', 'nowrap', or 'pre-line', it is removed. All tabs (U+0009) are rendered as a horizontal shift that lines up the start edge of the next glyph with the next tab stop. Tab stops occur at points that are mutiples of 8 times the width of a space (U+0020) rendered in the block's font from the block's starting content edge. If a space (U+0020) at the end of a line has 'white-space' set to 'normal', 'nowrap', or 'pre-line', it is also removed. If spaces (U+0020) or tabs (U+0009) at the end of a line have 'white-space' set to 'pre-wrap', UAs may visually collapse them. A float should not introduce a line break opportunity. Note. CSS 2.1 does not fully define where line breaking opportunities occur. Floated and absolutely-positioned elements do not introduce a line breaking opportunity. The space before the B ( ) would collapse with the space after the A ( ). The space before the C ( ) would collapse with the space after the B ( ). Note that there are two spaces between A and B, and none between B and C. This can sometimes be avoided by using the natural bidirectionality of characters instead of explicit embedding levels. Also, it is good to avoid spaces immediately inside start and end tags, as these tend to do weird things when dealing with white space collapsing. Control characters other than U+0009 (tab), U+000A (line feed), U+0020 (space), and U+202x (bidi formatting characters) are treated as characters to render in the same way as any normal character. Combining characters should be treated as part of the character with which they are supposed to combine. For example, :first-letter styles the entire glyph if you have content like "o<span>&#x308;</span>"; it doesn't just match the base character.